At some point in the life of any gut fretted instrument, there will come a day when worn or loose frets will start causing problems. I am happy to sort out fret problems on all my instruments but it is not always practical for a player to bring the instrument to the maker to do this maintenance work. It is, however, quite possible for owners to sort out their own frets with a little practice and patience. For those that want to have a go at re-freting, what follows is my method of tying gut frets. There are many different ways of doing this, but this is the method I use. It has the advantage of producing a small knot that, if positioned correctly, will not be too obtrusive. I use a system of, so called, graded frets. That is the diameter of the gut used for the frets decreases as you go down the neck towards the body. This, combined with the correct neck angle and fingerboard relief, enables me to achieve a low action without too much risk of strings buzzing on the next fret when played hard. When my new instruments are delivered they are provided with tables of the fret diameters used and the positions they should be in. 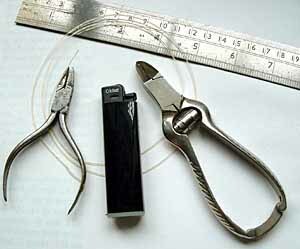 Nail clippers or small wire cutters. Fret position tables for the stringlength of your instrument. You should also have fret gut in a range of diameters available. This will usually start around	1mm and end up around 0.5mm. 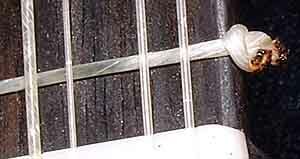 Frets should be tied with all the strings on and the instrument should be up to pitch. The size of the first fret will usually be around 1mm on my instruments. The exact gauge used	will be listed on the fret sheet that was supplied with the instrument. If you have not got a list of frets for your instrument, you can always measure an unworn part of the existing fret using a micrometer or vernier callipers. Start with the instrument on a flat soft surface with the neck towards you, the body away from you. 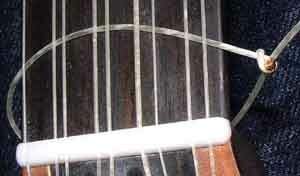 To tie the fret, thread a length of new gut under the strings from treble to bass. Bring the rest of the gut under the neck to the bass side. Let the end that emerges from under the strings be called the 'short end'. The rest of the gut is the 'long end'. Tie the knot, a simple 'granny', with the short end, around the long end. 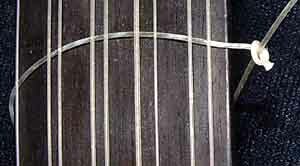 If you start by having the short end further down the neck than the long end and pass the short end under the long end towards yourself, you should find that the knot, when tightened, will lie flattish against the corner of the fingerboard. Using pliers, tighten the knot as tight as you can get it, then using clippers cut of the short	end to leave about 2-3mm beyond the knot. Using your lighter, bring the flame, carefully, just close enough to the short to singe it	until a small blob forms close up to the knot. Be sure not to burn your strings, hands or anything	else other that the fret gut. Some people prefer to use a small electric soldering iron	for this. 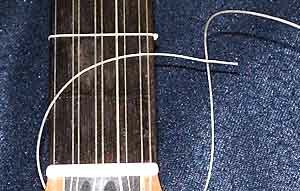 Please Note when pulling the fret tight it sometimes happens, especially with the thinner gut	sizes, that the knot can pull through suddenly causing a big jolt. It is therefore important not to have anything hard or sharp in the way that could damage you or your instrument if this happens. Now tighten the fret by pulling the long end, use the pliers if there is not enough to get hold of. If the knot was tight enough and the blob formed correctly, you should find that the fret kind of 'locks' as it gets tight. With thicker frets, you need to get the fret as tight as you can at the narrowest part of the neck that is available. If it is the first fret, this will be just beyond the nut, otherwise just in front of the previous fret. With thinner frets (less than 0.6mm) there is much more elasticity so you will not need to put in so much force to get them tight. Trim back the long end to leave 2-3mm as with the short end. Burn this free end back as before and slide the fret up the neck into its right position. If you have got the fret tight enough this should be quite difficult. Remember that over time the gut will stretch and loosen, so the tighter the better when they are new.